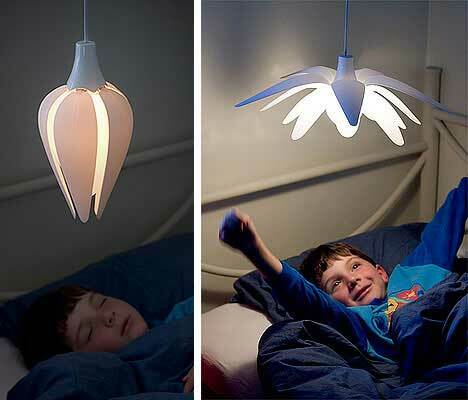 This is a cool light for the kids bedroom, the LULL. In the daytime the petals are open and the light shines at full brightness but when it’s time for the little ones to go to sleep the petals close and the light dims. I’ve no idea how the LULL works or if it’s just conceptual at the moment but if you know Norwegian please let us know via a comment because I want one. Found via freshome, thank you. With this lamp the Fredikstad based designers won an award. Marianne Varmi, Heidi Buene and Audun Kollstand won with their lamp “Lull”. “It was terrific fun” says Varmo, which as the other two lives in Fredrikstad. It was in the design competition GI FORM that the three reached the top. They won the showprice which was voted on during the Norwegian trade fair. The winners were published at the Gift & interiordesign fair earlier today. Norwegian industrial designers is behind the competition. The winners were awareded 15.000 NOK ~ 2500 USD. “That we won the showprice was great fun. There was also appointed a winner by the expert committee, but those the fact that those that are going to sell products like these believe in our product is even better” says Varmo. They have worked six months on their procject, and hope now that they will be able to put their lamp into production. “We have spoken with a manufactor which would discuss it further within their organization. We hope that the lamp will be available in stores some time in the future” says Varmo. This year 11 new designconcept attended the show, made by the countries most promising designers. The theme for this year was “Challenges within families with children”. The jury were looking for products that would give extra time for play and socializing in a busy weekday. The goal was to foind products and solutions that would simplify, charm and have a functional value, writes the Gift & interiordesign tradeshow on their own website. Hope they talk to IKEA. Is this light (LULL) available to purchase yet and if so where can i buy one – I Love it!!! if anyone has any info on how to purchase this light, let me know asap please. it would be a perfect addition to my kids’ room that we are presently remodeling. any help AT ALL would be greatly appreciated. what a great idea. thanks. What an awesome lamp/concept! I hope you find someone to put it into production for you soon! !